Need to organize pictures of your latest show or outing? Protect your 5 x 7 photos. Overall page size is 11 1/4 X 8 1/8. Standard size three-ring binders are recommended for these pages. Side Loading. Holds 4 - 5 x 7 Photos - APS Compatible. Polypropylene. 50/BX. Hi. I'm John at C-Line, and today we're going to talk about our 5" x 7" Photo Holders for 3-ring Binders. How many of us have a box full of photos sitting in our closet? 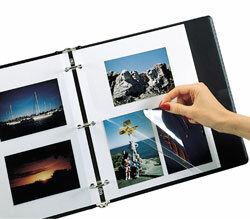 Wouldn't it be nice to display and organize your photos in 3-ring binders to be enjoyed by everyone? C-Line's 5" x 7" photo holders are the perfect solution. Each page safely stores four 5" x 7" photos. 2 on the front, and 2 on the back. And inserts for labeling your pictures are included. The holders are made from acid-free polypropylene to protect your photos for years to come. The pages fit in standard 3-ring binders for easy storage and organization. Say goodbye to photos with bent corners and fingerprints sitting in a box. And start organizing your photos with C-Line's Photo Holders. Order yours now! That's all we have for today. I'm John with C-Line. Thanks for watching.